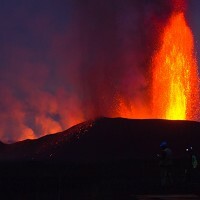 Holidaymakers who want to witness lava eruptions closely can visit Virunga National Park as it has organised overnight treks to the active volcano of Mount Nyamulagira in eastern Congo. The Nyamulagira volcano, which spurts fountains of lava nearly 650ft feet into the air, started erupting on November 6 and could continue to do so for days or even months. Tourists visiting Congo to watch the fiery scene can spend the night at camps set up by the park in a safe area close to Nyamulagira. Park authorities claim there is no danger to the surrounding population and the city of Goma, or the mountain gorillas and other wildlife as rivers of lava are flowing slowly north into an uninhabited part of the park. Although the volcano may not pose danger to travellers taking the treks, they are still better off taking out adequate travel insurance.